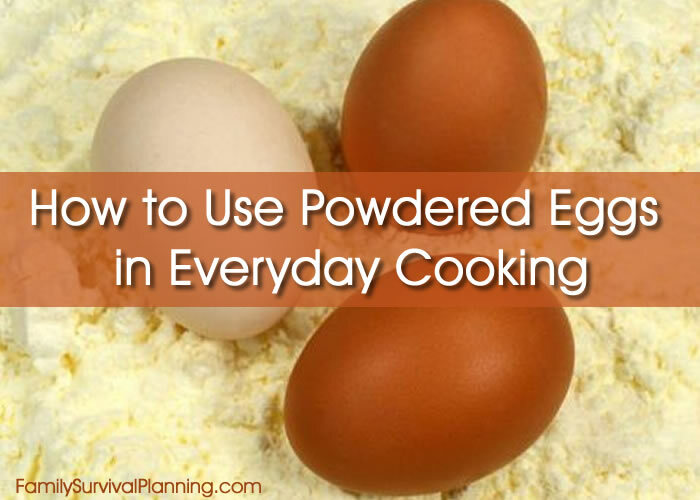 Have you ever tried using powdered or crystallized eggs in your recipes? Well, I have, and I was surprised that they actually taste good - like real eggs! One of my favorite things about powdered eggs is that you always have eggs when you're ready to cook. No more borrowing from the neighbor or running to the store when you're halfway through a recipe only to find that you don't have enough eggs. Dehydrated eggs can come in different forms, so let's see what the difference is. 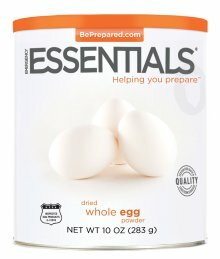 Whole egg powder is just that - whole eggs that have been dehydrated - some are freeze-dried. Their consistency and texture are similar to powdered milk. You can buy whole eggs, just the yolks, just the whites, or already scrambled in powdered form. They can be purchased in pouch sizes or #10 cans ( approximately 94 eggs) which makes them perfect for food storage. There are several advantages of powdered eggs over fresh eggs. With proper storage conditions (cool, dark, dry), dried eggs should ideally be rotated every 305 years. Although some claim to have used powdered eggs that were 10 years old. It is not necessary to store the eggs in the refrigerator, but, as mentioned, store in a cool, dark area. Eggs that have been dried require much less storage space. This means substantial supplies of eggs can be kept on hand in a relatively small space. Re-hydrating the eggs for use in omelets and to make scrambled eggs require nothing other than the addition of a liquid, usually water or milk. In powdered form, the eggs can be added to baked recipes without the need to mix them with a liquid ahead of time. Whole eggs can be used in recipes where whole eggs are called for. Powdered egg whites can be whipped into meringue for lemon pies or angel food cakes. When baking you do not need to re-hydrate the eggs before adding to your mix, simply add the needed egg powder and needed water to your mix and proceed as your recipe outlines. If you need to half a recipe, you can half an egg with the powdered mix. Never run out of eggs again! The cans come with an average the equivalent of 72-96 eggs (depending on the brand). An easy recipe for using your powdered eggs in breakfast foods. Put water and powdered egg mix in a bowl and whisk until well blended. Add dry milk, warm water, melted shortening/oil/butter, sugar and salt. Then add the flour, continuing to whisk until batter is smooth. Let sit for 5 minutes and mix again. Melt 1 teaspoon shortening or oil in a hot pan. Pour 1/2 cup batter into the middle, tilting the pan or griddle to form about an 8-inch circle. Cook until batter sets and edges start to brown a little. Flip carefully and cook other side. Serve at once with syrup or other toppings. 1) In a bowl, beat eggs. Beat in the milk, sugar, salt, cinnamon and nutmeg. Soak the slices of bread for 30 seconds on each side. Cook on a hot greased griddle until golden brown on both sides and cooked through. 2) Meanwhile, in a saucepan, combine the orange juice, corn syrup, sugar, butter and orange peel. Bring to a boil and boil for 2 minutes, stirring constantly. Remove from the heat; stir in extract. Serve over French toast. powdered eggs. Tuck away in your food storage recipe file and feel free to pass along to others.